2 Bedroom Flat For Sale in Tavistock for Offers in excess of £160,000. Immaculately presented two double ground floor flat in sought after development in Foundry Mews. 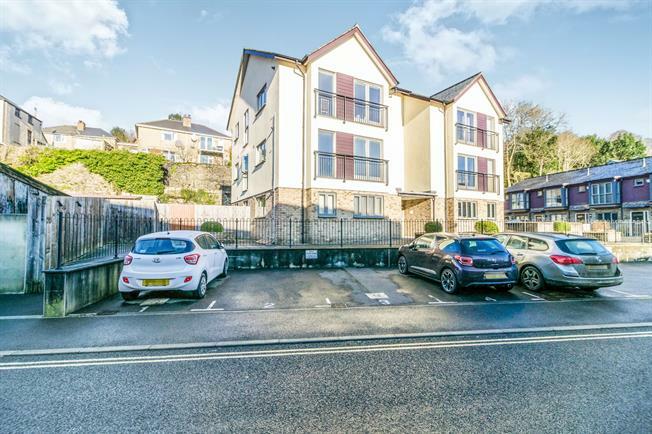 Within easy walking distance of Tavistock town centre which offers amenities including supermarkets, independent shops, cafes, restaurants and pubs. This purpose built apartment was built by Cavanna Homes and offers well proportioned rooms. The accommodation comprises of an entrance hallway, open plan living/dining/kitchen, two double bedrooms and bathroom. There are three communal gardens and an allocated car parking space. The property benefits from no onward chain, gas central heating and double glazed windows. Dual aspect windows to side and rear elevations. Fitted base and wall cabinets with worktop surfaces incorporating a one and half stainless steel sink unit and drainer. Intregrated gas hob with electric under under with stainless steel extractor hood over. Intregrated fridge/freezer. Space for washing machine and space for tumble dryer. Cupboard housing gas combination boiler. Two radiators. Television point. Telephone point. White suite comprising panelled bath with electric shower over. Tiled splash backs. Pedestal wash hand basin. Low level W.C. Shaver point. Radiator. Extractor fan. There are three communal gardens one with bike store and enclosed refuse area. There are two have pated patio.